YAH mugs are still in demand in Europe. Brand new release, Starbucks You Are Here Krakow is another example. – Kraków Cloth Hall – was once a major centre of international trade. It is listed as a UNESCO World Heritage Site since 1978. – St. Mary’s Basilica – one of the best examples of Polish Gothic architecture. Probably the most interesting detail here – its towers are of a different design and height. 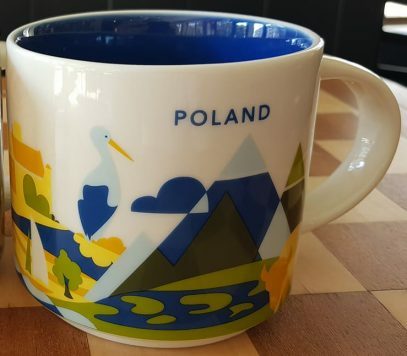 This Icon mug came from Warsaw, Poland. Red is used as its theme color. Frederic Chopin Statue can be seen on the front of the mug and Rynek Starego Miasta (Old Town Market Place) on the back. This Icon mug came from Wroclaw, Poland. Red is used as its theme color. Ostrow Tumski can be seen on the front of the mug and Old Town Houses on the back. This Icon mug came from Poznan, Poland. Dark Blue is used as its theme color. Town Hall can be seen on the front of the mug and Old Town Square on the back. This Icon mug came from Gdansk, Poland. Blue is used as its theme color. Neptune Fountain can be seen on the front of the mug and Old Town on the back.